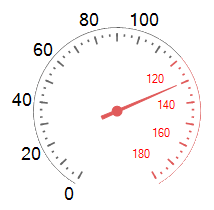 RadialGaugeLabels class represents the scale labels displayed next to the ticks. LabelFontSize - specifies the font size. On the following picture the black labels font size is 8 but the red labels font size is 5. LabelStartVisibleRange - specifies the start value from which the labels are displayed. On the following picture the black labels starts from value 40 but the red labels start from value 140. LabelEndVisibleRange - specifies the end value to which the labels are displayed. On the following picture the black labels ends with value 60 but the red labels ends with value 140. 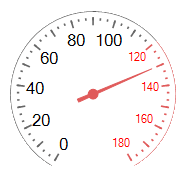 LabelRadiusPercentage - controls how far according to the gauge's arc the labels are rendered. 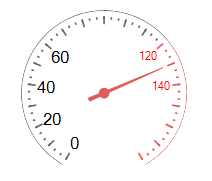 If the LabelRadiusPercentage is greater than 100, the labels will be displayed outside the gauge. The smaller the value is, the closer to the center the label gets. LabelFormat - specifies the format of the label's value. 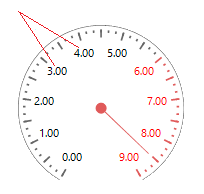 You can display labels with one digit after the decimal place, e.g. refer to the black labels below. 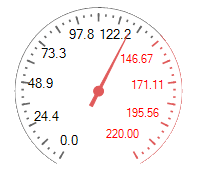 The red ones show two digits after the decimal place. LabelsCount - controls how many labels will be displayed next ticks for the specified range. 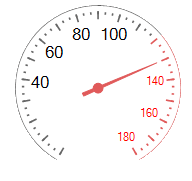 RadRadialGauge always displays one additional label to the LabelsCount in order to distribute the labels correctly on the arc.